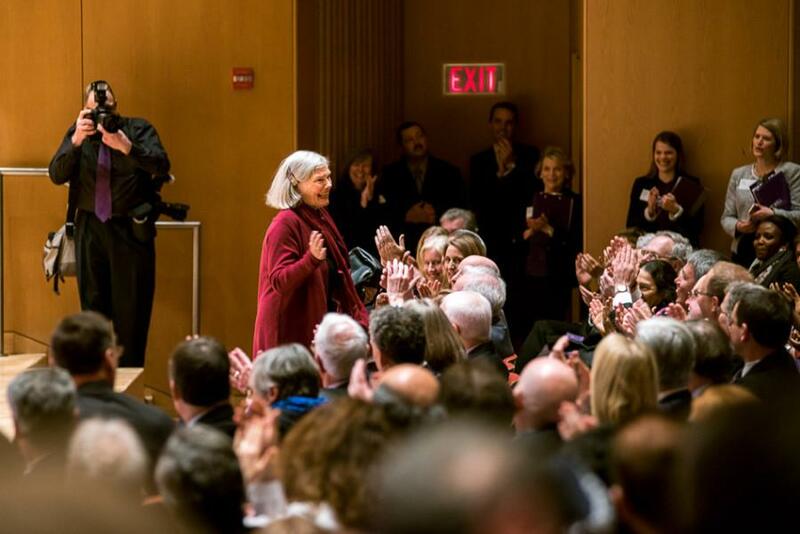 Northwestern recognizes Roberta Buffett Elliott (Weinberg ‘54) for her record-setting donation to the University. The younger sister of financier Warren Buffett gave more than $100 million toward a new Global Studies Institute. When University President Morton Schapiro met with Roberta Buffett Elliott in December, he expected to discuss the estate of the 1954 Weinberg graduate. But as he and the younger sister of business magnate Warren Buffett discussed potential uses for the money, she took him by surprise. “As we talked about all the things we could do, she said, ‘I don’t want to wait until I’m gone to do this,’” Schapiro said in an interview with The Daily. The University announced on Wednesday that Elliott has donated the largest single gift in Northwestern history to expand the University’s international programming and scholarships for international students. Elliott funded the entire gift of more than $100 million immediately, a decision Schapiro said is unheard of in fundraising. The large donation will establish an Institute of Global Studies in her name and support scholarships for international students. The gift is part of the NU $3.75 billion “We Will” campaign, bringing the total raised to more than $2 billion and marking a new fundraising record for the University. Schapiro announced the gift to a packed Pick-Staiger Concert Hall, where faculty and students gathered to get a glimpse of the famed financier and hear a panel featuring some of NU’s most prominent professors, the Northwestern University in Qatar dean and a Feinberg student interested in global health. The panelists discussed global issues and how the new gift could be implemented. Schapiro presented a plaque to Elliott, who was escorted to the stage with Buffett holding her arm. The investor quickly returned to his seat to give his sister her time in the spotlight. Neither spoke at the event. Before presenting the gift, Schapiro joked that there is no way to repay Elliott for her generous donation to the University, but it was “a pretty nice plaque.” It was one of many jokes Schapiro peppered throughout the panel. “If you’re planning to take a selfie with Warren, be warned. I go first,” Schapiro said drawing laughter from the audience. Because Elliott made the gift in full, Schapiro is under pressure to use it immediately. NU can now begin to look for an institute director, who the University hopes will bring high-level experience from government or academia. Schapiro said he established a search committee earlier this week and that with the large size of the gift, committee members should have exciting options for the position. The institute’s programming will focus on multi-disciplinary approaches to solving global problems, ranging from how to spread democratic political systems to immigration policies. At Wednesday’s panel event, political science Prof. Beth Shakman Hurd spoke about her research on religious tolerance and how grant money could break down interdisciplinary and geographic barriers to studying this area. NU will hire new faculty members with appointments across departments to specialize on international issues. It also will finance faculty-led research projects that focus on global issues. Up to $20 million could be used as a grant to challenge donors to match it to sponsor scholarships for international students. Schapiro said his goal is to raise at least $50 million in scholarships for these students. Currently the University offers limited need-based financial aid to international students but warns the admissions rate is less favorable to international students requesting aid. Schapiro told The Daily that creating scholarships for international students is a personal passion of his. During his tenure as president of Williams College, the school became need-blind to international applicants. Since he left, the school has since reversed its policy, but he said he hopes to one day create the same policy at NU. The funding also will create a visiting scholars program, provide funding for graduate student fellowships and establish a postdoctoral fellows program. Elliott, who graduated Phi Beta Kappa and once served on The Daily’s staff, has made many donations to NU, enabling the expansion of the Center for International and Comparative Studies, now called the Roberta Buffett Center. Two of her grandchildren are NU graduates, and one is a current student. Including previous donations, she and her husband have given $110 million to NU. The University has long had its sights on expanding international programming, with much of Schapiro’s tenure marked by visits to other countries to introduce international students to NU. The University opened its first school outside the United States in Qatar in 2008, and global expansion was a major focus of the strategic plan Schapiro created at the start of his presidency. Throughout Wednesday’s event, the panelists emphasized the increasing need for students to be global leaders, no matter what their area of study is. Slavic languages and literature Prof. Gary Saul Morson spoke about the importance of literature in building a global perspective. ​This post was updated at 11:15 p.m. with additional information.